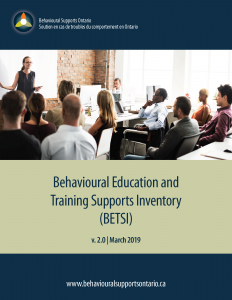 The Behavioural Education and Training Support Inventory Working Group is pleased to announce the release of the updated ‘Behavioural Education and Training Support Inventory’ (BETSI). It is our hope that you will all find this document particularly helpful when making decisions related to the selection of education/training programs for capacity building with those supporting the Behavioural Supports Ontario (BSO) Population. During the process of developing this document, the BETSI Working Group has received valuable feedback from many key partners and wishes to particularly acknowledge contributions from those who responded to the BETSI User Survey (August 2017), the BSO Provincial Steering Committee, the BSO Operations Committee, the BSO Knowledge Translation & Communications Advisory and the BSO Knowledge to Practice Community of Practice. In addition, the BETSI Working Group wishes to thank all of the Program Representatives for taking the time to submit applications for inclusion into the updated BETSI. The updated BETSI can be found here. Questions or feedback pertaining to the BETSI can be directed to provincialbso@nbrhc.on.ca or call 1-855-276-6313.